Are you living in a safe, healthy home? Get Clean, Safe, Non-toxic products for the whole family! Are you using Healthy Home Products? You know that good, healthy feeling you get when you’ve just cleaned house? Sorry to spoil it, but you may have just made your home dirtier. Think of it this way. You wouldn’t let your kids play with toxic chemicals, so why would you let the baby crawl over a floor that’s just been wiped with them? That’s much more dangerous than the orange juice that was just there. How dangerous? Just take a look at these statistics. Common bleach is the #1 household chemical involved in poisoning. Organic pollutants, found in many common cleaners and even air fresheners, are 2 to 5 times higher inside your home than out. A person who spends 15 minutes cleaning scale off shower walls could inhale three times the “acute one-hour exposure limit” for glycol ether-containing products set by the California Office of Environmental Health Hazard Assessment. Common cleaners give off fumes that have been linked to increasing the risk of your kids developing asthma, the most common serious chronic childhood disease. 1 in 13 school-aged children has asthma. Rates in children under five have increased more than 160%from 1980 – 1994. Children are highly vulnerable to chemical toxicants. Pound for pound of body weight, children drink more water, eat more food and breathe more air than adults. The implication of this is that children will have substantially heavier exposures than adults to any toxicants that are present in water, food or air. If your home is anything like the average North American home, you generate more than 20 pounds of household hazardous waste each year (the EPA designates toilet cleaners, tub and tile cleaners, oven cleaners, and bleach as hazardous waste). Get your Shaklee Get Clean Starter Kit now! Plant a tree. Change a light bulb. Drive less. Everyone can make a difference and everyone can do their part. 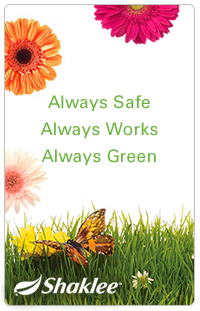 Choose environmentally safe products for your family and the planet!